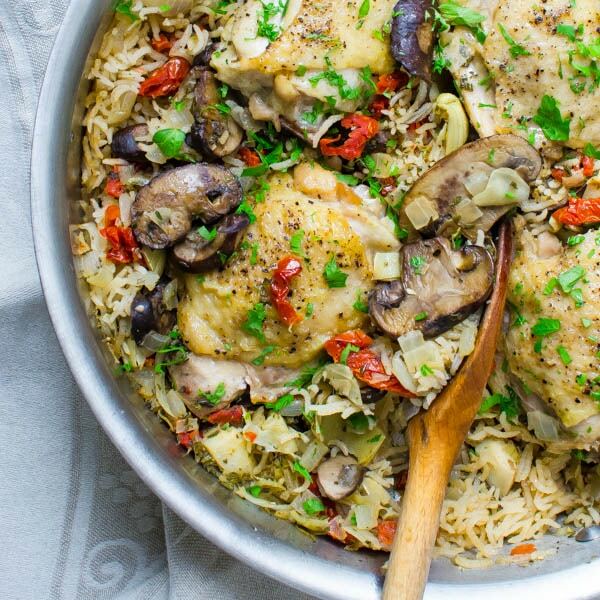 Looking for a weeknight dinner that’s ready in under 30 minutes? 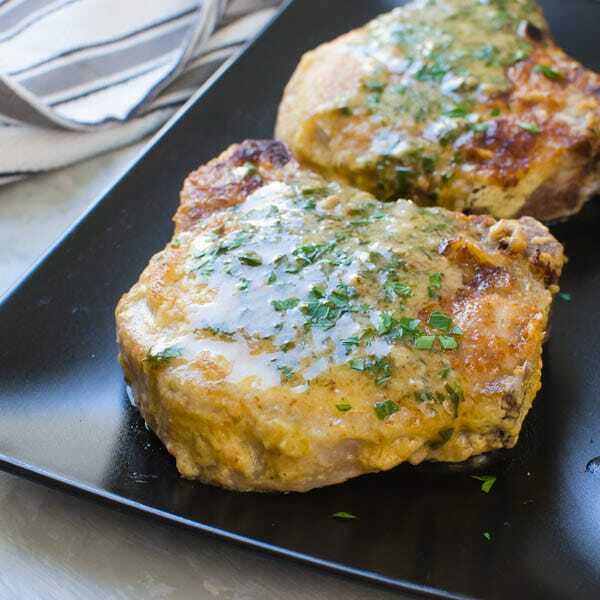 Try these tasty Pork Chops with Pan Gravy. They’re super easy to make, don’t require advance planning and you probably already have the ingredients. 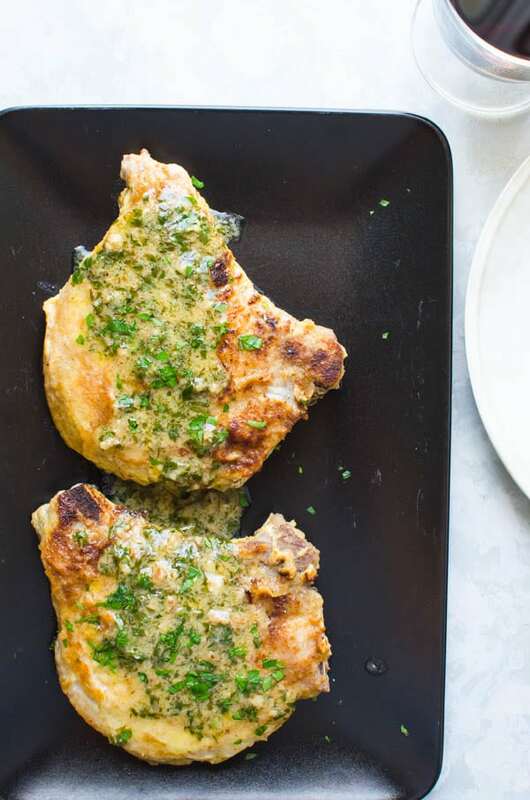 These dijon mustard spiked pork chops will be your new favorite way to prepare pork. 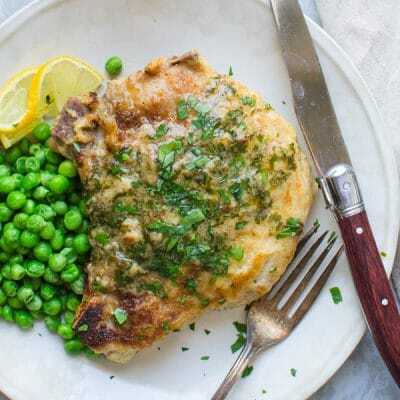 Everyone loves an easy weeknight dinner recipe and these Pork Chops with Pan Gravy will be another go-to favorite for your family. What could be easier than cooking pork chops in a pan, right? But the thing is there’s a trick to getting a moist flavorful chop — a finesse if you will… especially if you haven’t been able to brine them or season ahead of time. 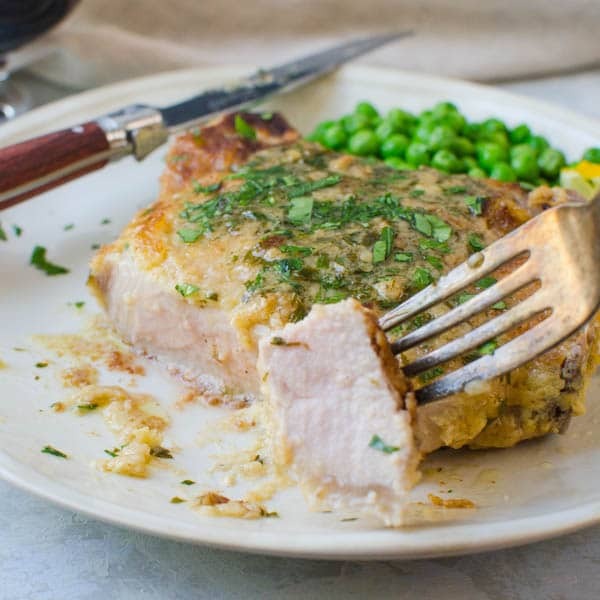 These pork chops get a flavor boost from a really simple dredge. Not your standard flour-egg wash-breadcrumb coating. Nope. The secret is dijon mustard and milk. Whaaatttt???? Yes. 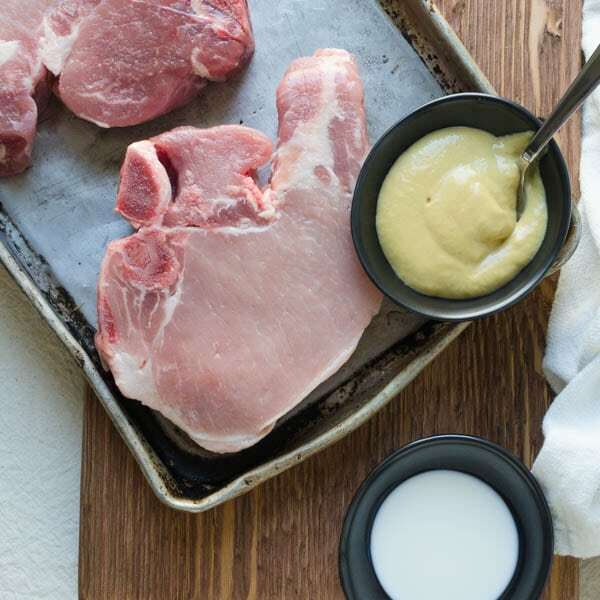 Just a bit of French dijon mustard (use your favorite brand) mixed with a little milk to thin it out and these dijon pork chops are well on their way to happy town. Coat the chops in the mustard mixture and then dredge them in dry breadcrumbs. You can use seasoned or plain breadcrumbs for this recipe — whatever you have on hand. The key is to coat them evenly and set them on a baking sheet lined with parchment paper until you’re ready to fry. Make sure you’re using a large enough skillet to easily hold the chops, you don’t want to crowd them. Heat the pan over medium-medium high heat (if your stove runs hot, keep it at medium). When the pan is hot (you should be able to hold your hand about 2-3 inches above the surface for 3-4 seconds before it gets too hot. Add the oil and swirl it around in the pan. If the pan is hot enough it will shimmer and slick across the pan. Place the pork chops in the pan AND DO NOT TOUCH THEM. Use a pair of tongs to flip the pork chops. If they stick, they probably need another minute or two in the pan. Generally, the meat will tell you when it’s ready and will release from the pan on it’s own. Check again that there’s enough oil in the skillet to continue the searing/frying process and add more if necessary. Transfer the chops to a platter. Add a pat of butter to the pan and whisk to emulsify. Whisk in parsley and taste for seasoning. (Add salt and pepper if needed). Pour the pan sauce over the pork and serve. Pork should still be slightly pink in the center. 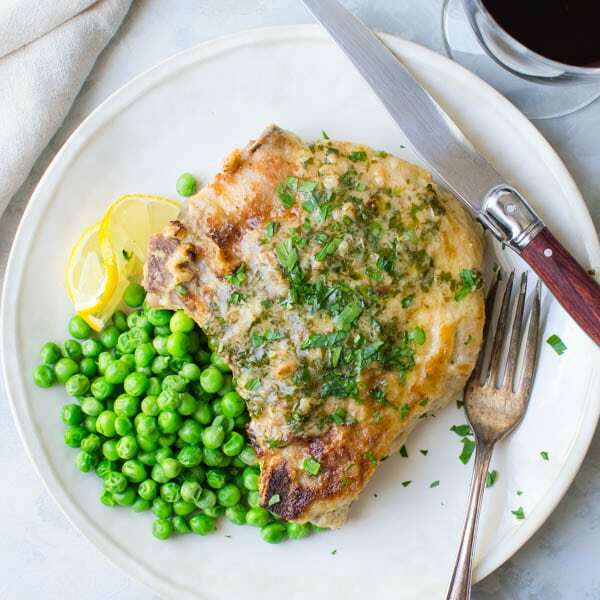 Breaded fried pork chops has always been a comfort food classic and these tender chops are so juicy and flavorful, you won’t need a side of applesauce to choke them down with (yeah, I’ve had some dry pork in my day). In fact, I’d recommend some creamy mashed cauliflower or these easy roasted potatoes as an excellent accompaniment. This easy pan fried pork chops recipe can be scaled to however many people you’re serving There’s just two of us in our house, so this amount works well… but if you’ve got four or six, just scale it up. I love recipes that work like that, don’t you? 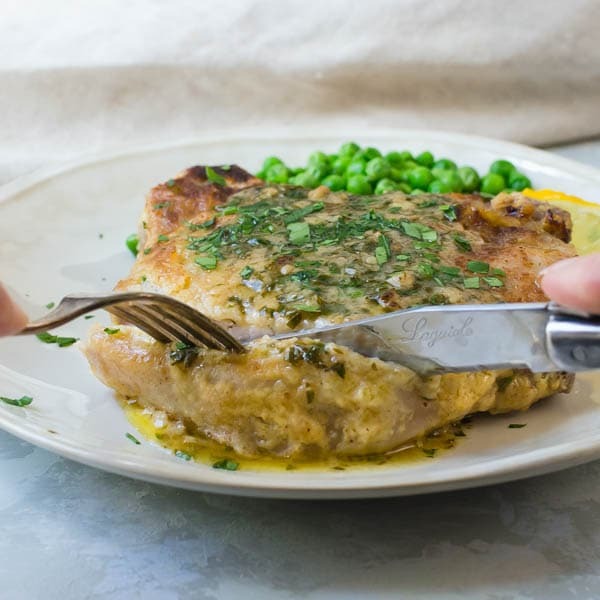 The lemon dijon sauce is mouthwatering over the hearty pork, if not somewhat addictive. That extra shot of lemon and butter at the end of prep make all the difference. The sauce is so luscious, rich and tangy, you don’t need a lot. You can make this recipe with boneless skinless chicken breasts too and it will be amazing! A quick and easy preparation that's great for quick weeknight meals. Serve it with buttered noodles, couscous or mashed potatoes or cauliflower and a green vegetable. You won't have leftovers. In a small bowl, combine the dijon mustard and milk. Stir to combine. 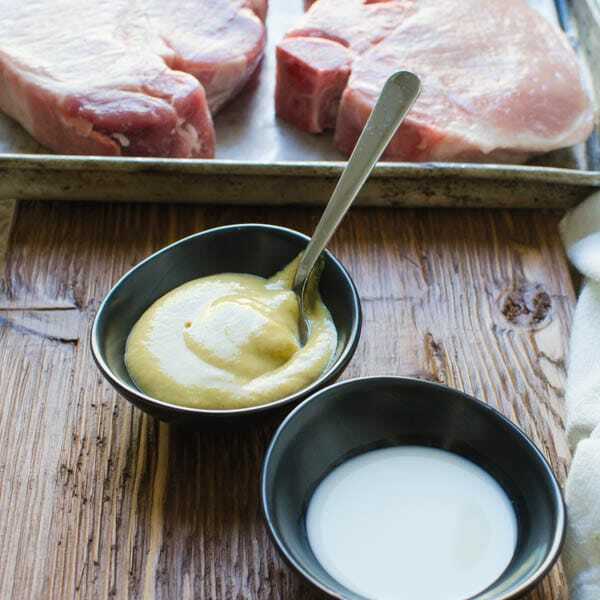 Pour the mustard mixture over the pork chops and spread it over the chops to coat. Add the breadcrumbs to a shallow dish. Dip the pork chops into the breadcrumbs to coat on both sides. Heat a large skillet over medium- medium high heat. Add the olive oil to the skillet. When the oil is hot add the pork chops to the pan and cook for 2-3 minutes until browned, flip the pork chops over and brown on the second side. If you need more oil for the pan add it in 1-2 teaspoon increments. Cook for 2 minutes, then squeeze the lemon juice from the lemon over the pork chops. Add the water and cover the pork tightly with a lid. Cook for 5-6 minutes, until pork is done, but still slightly pink in the middle. Transfer the pork chops to a serving platter. 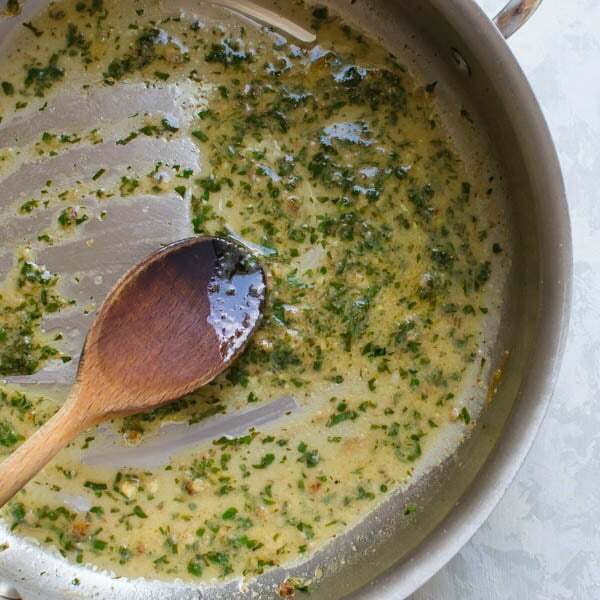 Add the parsley and butter to the pan and whisk until emulsified and a pan sauce forms. 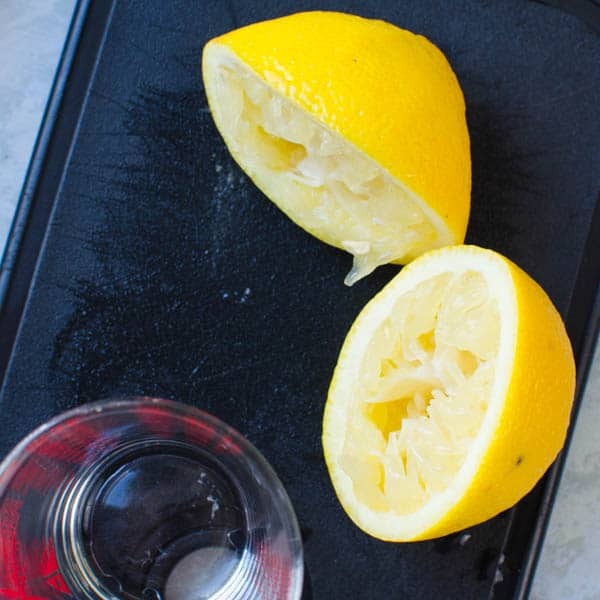 Note: if you need more liquid, you can add a little more water (2 tablespoons) and a squeeze more lemon. Pour the sauce over the pork chops and serve. This is such an awesome recipe. I love using dijon mustard in my cooking. It took me a long time to finally stop messing with my meat when searing it. Now I just have to keep the boyfriend away, because he always want to mess with it! Love the detailed explanation – pan-frying isn’t as easy as it seems! These pork chops look to die for. I love having quick pork chops for dinner but don’t always get a chance to brine them, and sadly they are sometimes dry. Your trick with the mustard to keep the breadcrumbs on is great and I have to try this. And the sear-sear-steam is so easy. Perfect for a weeknight. The colours are so springlike and appealing, even if the weather (here) isn’t . Um, can I have this for dinner please? Those chops look SO delicious! Such beautiful pork chops! I love how easily they come together. Coating with that dijon mustard sounds perfect. I love how easy this recipe is. 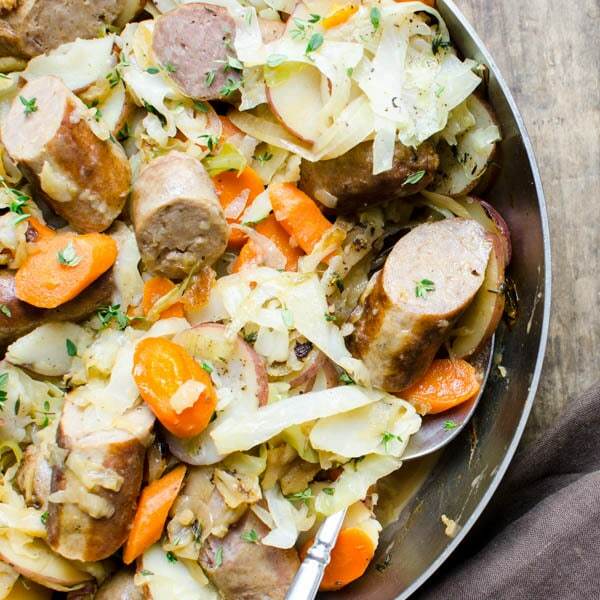 Perfect to just throw together for a quick weeknight meal. Dijon mustard has so much flavor so I’m sure that takes this to the next level of Yum!